The stilt walker is one of the most intriguing attractions at any circus or parade wherever one appears. The body of a person standing well above the crowd walking on long stiff legs really stirs the imagination: “Wouldn’t it be neat to be as tall as that, standing above everyone else!” It would probably get very tiresome very quickly. The stilt walker has even found his way into our language, as the adjective stilted is defined as “describing something – usually a style of writing or speaking – that is unnaturally formal. Imagine someone walking awkwardly on a pair of stilts and you have a good impression of the word stilted – wooden and stiff.” In my collection of thousands of photos, I could only find one of a juggling stilt walker, from a family vacation in 2003, during the very earliest days of my venture into photography. While there are six species of Stilts worldwide, only one, the Black-necked can be found in North America. 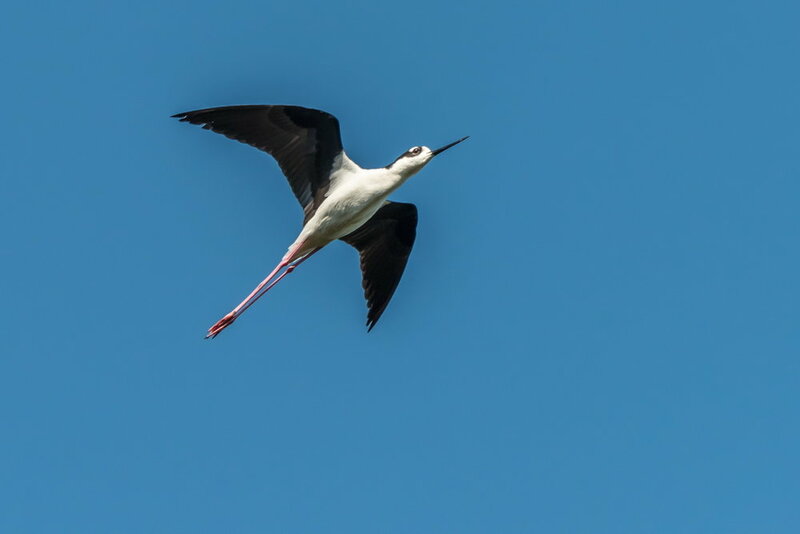 All six stilt species have some form of the black and white and the unique long legs. But like their namesake human stilt walkers, wherever you find Black-necked Stilts they are a leading attention getter. Beautiful elegant birds, they do not need to add to their attraction by juggling or dancing or some of the other fancy moves human stilt walkers employ to draw attention. Spotting Black-necked Stilts is always a highlight of any birding trip or experience. For all you ever wanted to know about the history and different types, styles and activities of human stilt walkers, see: en.wikipedia.org/wiki/Stilts. 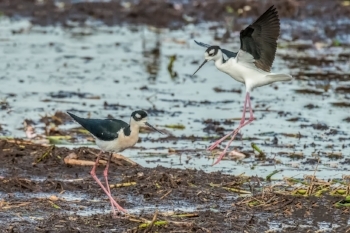 For more on Black-necked Stilts “knees” as “heels” see: gustaviatex.com/blog/2015/6/2/the-longest-legs.